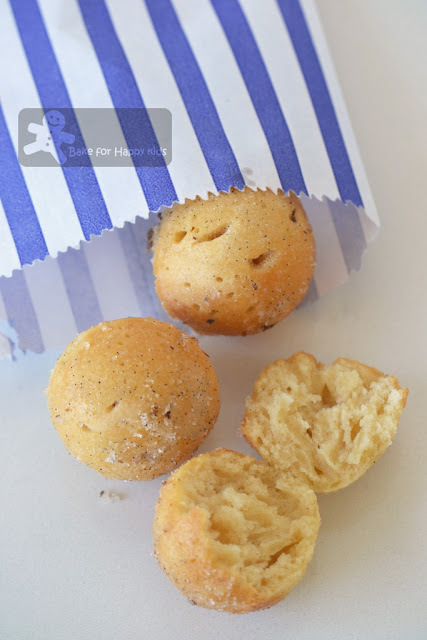 When Joyce from Kitchen Flavours suggested this recipe for our bake-along with me and Lena, from Frozen wings, I thought instantly that this recipe seems similar to the Donna Hay's doughnuts muffins that I have baked previously. You know what? It is true that they are the SAME! Exactly the SAME? Not exactly... The only different is the butter content in this recipe is 40g lesser than the other one. Apart from the butter content, the addition of chocolate filling, baking soda and nutmeg, everything else including the method of these two recipes are exactly the same. Like how both recipes emphasized these doughnuts are not fried but baked! Their texture are not exactly like the traditional fried yeast doughnuts but pretty similar being bouncy and delicious with sugar coating. The only drawback is that these baked doughnuts are best when they are freshly baked as they are not as good on the next day. Unlike the previous Donna Hay's doughnuts muffins that I have baked, there are no soft chocolate filling in these doughnuts. I didn't want to replicate this recipe with any chocolate filling and I choose to stick to this recipe for its original just-doughnut-y taste. Having no chocolate or any other fillings in these doughnuts, I keep asking myself... Are these cinnamon doughnuts too plain? How about dunking them into my very vanilla-cinnamon-infused sugar instead? 1. Preheat oven to 350ºF or (160ºC fan forced). Lightly spray 12 large muffin cups or cake balls tin. 2. Mix together the flour, baking soda (I didn't add this), baking powder, salt, nutmeg, and cardamom (or cinnamon). In a medium bowl, combine milk and buttermilk (or yogurt). 3. In a large bowl, using a handheld mixer on medium speed, cream the butter. Turn the speed to low and gradually add the sugar. Mix until mixture lightens in color. Add the eggs, one at a time, beating until just combined. Add the dry ingredients in thirds, alternating with the milk mixture, mixing just until smooth; do not overmix. 4. 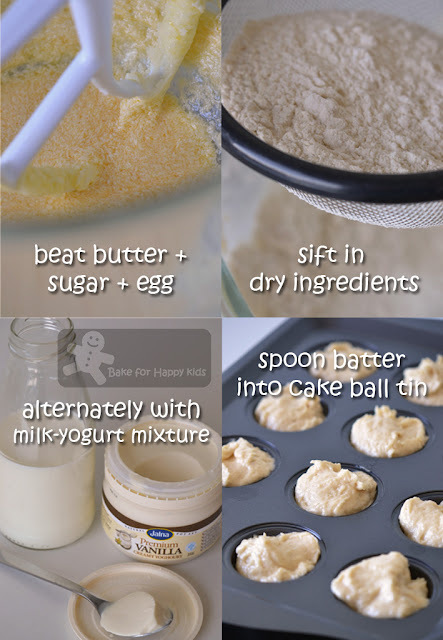 With a large ice cream scoop or spoon, scoop the batter into the prepared baking tin, filling them approximately 2/3 full (or completely full for cake balls tin, secure tin with its cover using silicon clips). Bake for 20-25 mins, until the tops are firm to the touch and lightly golden. 1. While the muffins bake, set up 2 bowls to dunk them in. In one bowl you will have the melted butter, and in the other bowl you will have the cinnamon sugar. 2. Let the muffins cool completely on a wire rack. Dunk them in the melted butter, then coat them with the cinnamon sugar. Note: Using half of the recipe, I have baked 16 cake ball doughnuts at 160ºC fan forced for 15 mins. Place sugar in a mixing bowl. Stir in ground cinnamon and the seeds scraped from the vanilla pod. Add the vanilla pods to the bowl and bash them up a bit with a wooden spoon to release extra flavour. 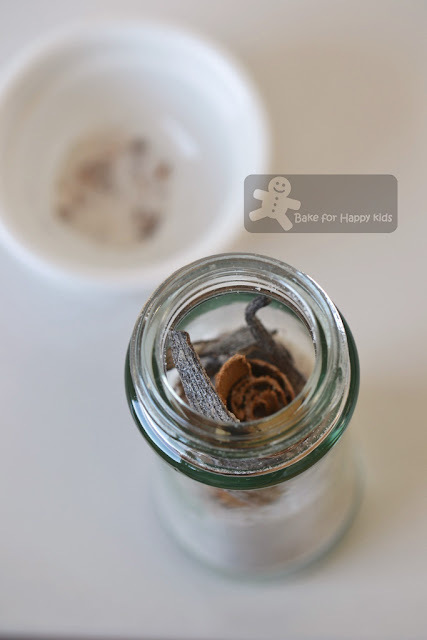 Transfer the mixture to an airtight container, add cinnamon stick and pop the lid on. This mixture can be kept for ages and I have kept mine for at least 6 months. What fun treats! Love it. This is "extraordinary" donuts, not the regular shape and size :) looks delicious! They look so good! I've never seen a tin like that but now I want one too. good morning , so is this a new pan that you got from your recent trip? These doughnuts were good, though not as fluffy but still soft and i find that they were still soft the next day. I didn't buy this from USA but bought this from our local Kmart, so much cheaper than from TV media. Such cute little doughnuts! Maybe u ladies can try the cronut soon. I love that donut tin! Never seen it before in Singapore. The donut itself was a little plain, but with the sugar it was delicious! My batch was gone in no time. Love the rounded shape of your doughnut muffins. Cool pans! Have not seen it before! Same recipe! Maybe these doughnut muffins recipe are pretty standard, otherwise, who is the copycat? Haha! These doughnuts are so cute!! The texture looks perfect. I hope to make these tomorrow. My first try was a failure. Loved them Zoe.. I am bookmarking this.. They look simple to make & the end result is a beauty which I got attracted to.. Soft muffin shaped donuts.. YUM !! Compliments, I've taken the recipe! Cute looking donuts. Like the black vanilla specks on the donuts. Like Baby Sumo suggested, maybe we can try Cronut in the bake along. It's popping everywhere. Zoe, your cake pan is so unique! Can make round shaped muffins and they are so cute. 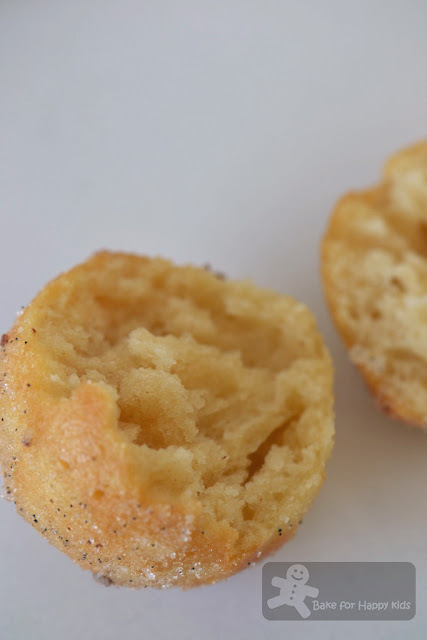 Your vanilla cinnamon infused sugar made these mini doughnut muffins extra special. Love that kitchen gadget, Zoe! Looks like fun! So did u like the way I had described u in my post? Heehee! Of course, I like the way you wrote about me being sweet :D I do have sweet tooth for cakes and biscuits. Super cute and very attractive doughnuts.. I've seen doughnut muffins on a number of blogs, but still haven't tried them. Cute, lovely and delicious. I love doughnuts. This looks special for me. i thinks this shape will attract my kids to eat them. These are too cute!!! We need this pan!!! 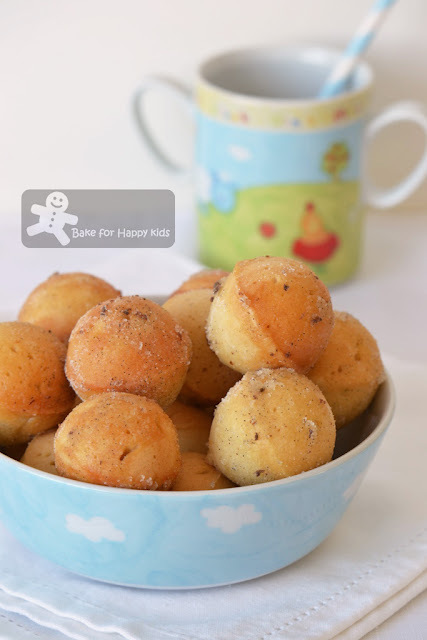 These little doughnut muffins looks so cute...and vanilla sounds delicious with sugar and cinnamon. Zoe, how are doing over there? Love your doughnut balls. You know what, I've bought the same tray like yours last Saturday. I'm good. What a coincident that we both bought the same thing! 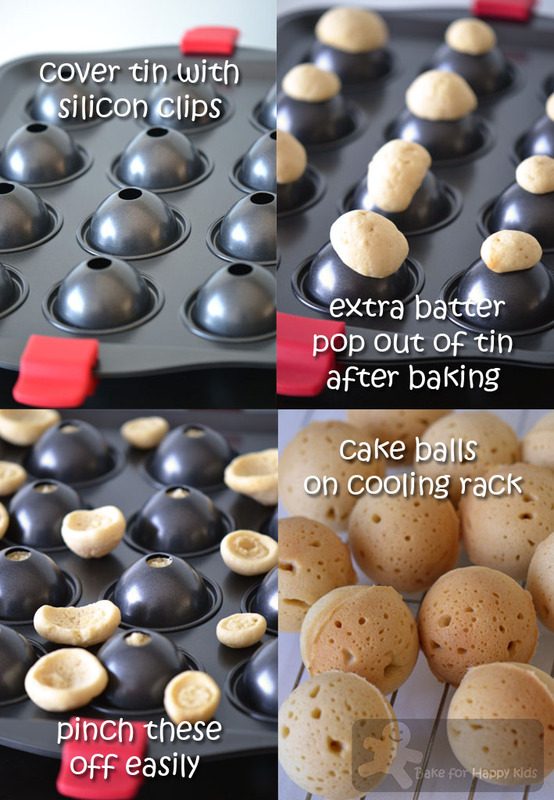 First time seeing a cake mould that has clips to make cake balls, very interesting! Your Doughnut Muffin is good to have it with a cup of coffee! I am sure I could pop these in my mouth like popcorn:) They look so yummy:) I love that pan! 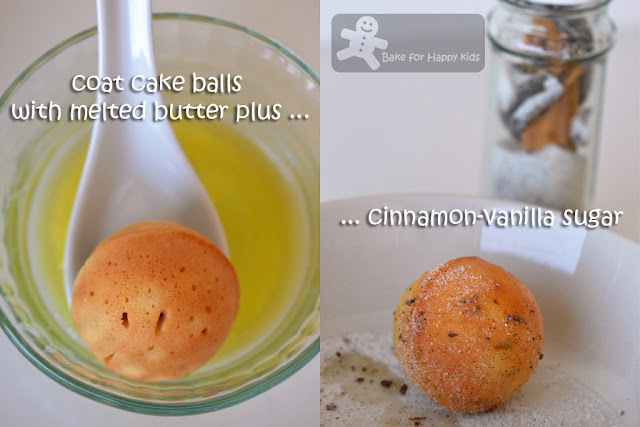 Hi Zoe,your doughnut balls looks cute and the mould of making them is very special too. I love doughnut! Hope I can have time to bake along with you all :) cheers.